In our previous post, we discussed how to use rising rush and main ability in DB Legends. Now, today, In this post, we will learn how to use special skill and special move. 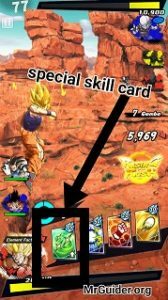 Let’s start the Dragon Ball Legends Special skill & move guide without wasting time. In the story mode, “special skill” and “special move” is the most common task/challenge you get at each chapter. And completing this task is very simple; all you need to do is use “green card” and “special card”. The green card is used to cast special skill. And to deal more damage to an enemy, you can use the special move. But, there is a catch. The number of cards you get while battling against enemies is limited. 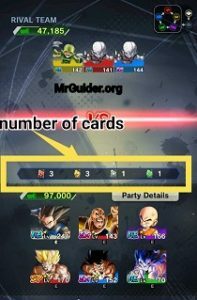 Before you start the battle, take a look at the number of cards you will get; it depends on the character you choose for the battle. 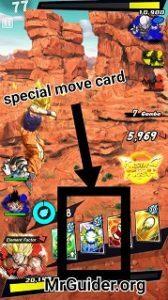 As you can see in above picture, by default(We have not yet selected characters); we get three strike cards, three blast cards, one special move card, and one green/special skill card. Here’s the catch: – Look at the above picture; my team’s power is 97,000 and opponent’s team power is 47,185. It means I can easily win the battle(even with one character). But to clear the challenge; I have to use one special skill or green card. And it is not necessary that I will get the special skill card at the beginning of the battle. It may come at the end. For this, I have to waste my cards; because the number of strike cards and blast cards is more than the number of special skill cards. In short, to get the special skill card/green card in the battle, you have to waste strike & blast cards. To waste these cards, use it when you see (i) icon(this warning icon states that opponent is going to attack). You can check the detail of all the art cards by visiting character’s info section.